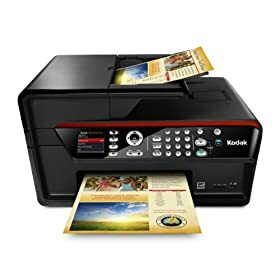 It’s time to simplify your workload and lower your ink costs with the KODAK OFFICE HERO 6.1 All-in-One Printer. With fairly priced ink and a full suite of productivity tools, it lets you spend more time on your business and less on printing. It multitasks as much as you do, letting you copy, scan, fax, and print wirelessly — even double-sided. No matter where business happens, GOOGLE Cloud Print lets you send emails and attachments back to your office from a laptop or smartphone, so your documents are waiting when you walk in the door. Smart Sensor technology predicts the supplies and time you’ll need before you start that next big print run. And you can rely on KODAK Quality for crisp documents and brilliant images, from first print to last. It’s the intelligent way to keep your budget in line and your business on the move.